An Acropora coral in the midst of bleaching, as captured by Peter Kragh. The work of wildlife cameraman Peter Kragh has been seen in many recognizable projects including BBC’s Planet Earth and Life, Nat Geo’s Secret Life of Predators, and the IMAX films Journey to the South Pacific, Under the Sea 3-D, Deep Sea 3-D, and more. Recently, Kragh has uploaded and shared a few select videos through his YouTube channel that you won’t want to miss. 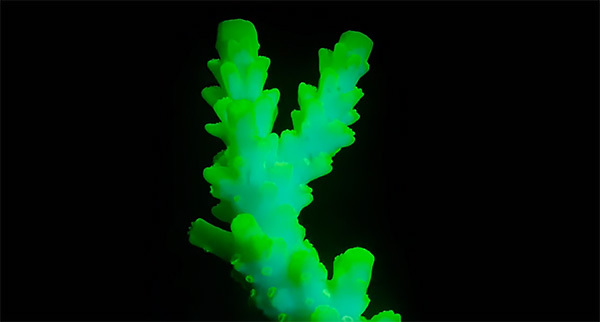 Both videos are time-lapse depictions of Acropora spp. growing in the aquarium. The first installment simply illustrates coral growth, including an example showing a broken tip, which later heals and then continues to grow. The second video, which has arguably more compelling and fascinating footage, documents what happens when the aquarium water is warmed. The results demonstrate the process of coral bleaching, whereby the coral stops growing, expels its zooxanthellae, and, in the first two examples, proceeds to perish. The footage is gripping and not to be missed. To learn more about Kragh and his work, visit http://www.peterkragh.com/. You can also find more amazing footage (including watching Wolf Eels, Anarrhichthys ocellatus, hatch and grow up) on his YouTube channel, and a bit more on his Vimeo channel.